I heart cycling: Tour d'Ecosse Day 15 Tarbert to Ardrossan via Isle of Bute Saturday 16th July 2016 THE END! 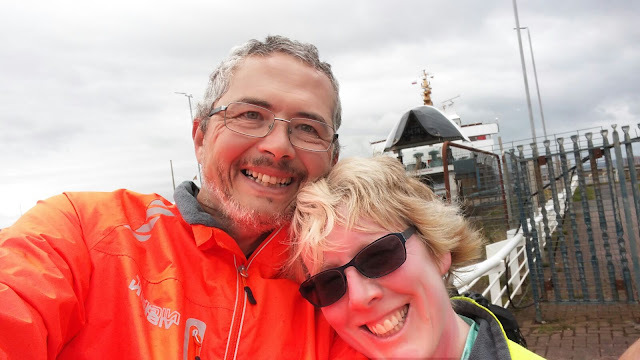 Tour d'Ecosse Day 15 Tarbert to Ardrossan via Isle of Bute Saturday 16th July 2016 THE END! Tour d'Ecosse Day 15 Tarbert to Ardrossan via Bute 97 km 940m ascent THE END! The End...shall we get the boat to Arran and do it all again? Our final day. It was supposed to be a day of two halves, contrasting the Secret Argyll Coast with the industrial Ayrshire coast, which could not be avoided if we were keeping the route a complete loop, by finishing in Ardrossan where hopefully the car is still parked! In fact it ended up being a day of three thirds as we decided to go a bit off piste and disobey our carefully planned route properly for the first time! As we had had plenty of time yesterday we thought squeezing in another island could be fun, and were puzzled as to why the original (and as it turns out absolutely excellent and spot on about most of it's advice) guidebook we based our tour on did not do this (Cycling the Hebrides Richard Barrett Cicerone Press) I even messaged our good friends back home who had been cheering us on remotely throughout, to ask permission, and was given the green light. We had checked the ferry times. This was the original plan for the first half of the day. c) our very last stint, back en route, down the industrial Ayrshire coast to Ardrossan. We left at 7.45 to snag the 8.00 CalMac Tarbert to Portavidie, aka Ferry#13 We purchased CalMac Hopscotch 4 Bute, Cowal & Kintyre tickets for our three ferries today: Tarbert (Loch Fyne) - Portavadie (Argyll); Colintraive (Argyll) - Rhubodach (Bute); Rothesay (Bute) - Wemyss Bay (Ayrshire). Three ferries for £6.75 per person, as ever bikes are free. I presume this is Rhubodach? Steve had had enough and wanted to take the shortest way to Rothesay. He was very happy to wait whilst I looped round the island. So we had an argument, I stamped my feet and said after all this adventure why spoil it by not doing the last day justice, and doing it on my own would really spoil it for me, a true diva moment. I got my way and he trudged along. It was, embarrassingly, at this point we came across a father/ teenage daughter pairing out for a bimble round Bute. We sort of rode with them, sharing some mixed nuts and a bit of chat. OK, we made a mistake. Bute is boring. Not boring in most people's terms, but not a jot on the scenery and landscapes and wild places we had travelled. Empty but not wild, all rather tame. The top half is very flat, and the bottom half fairly flat. Brilliant for short loops and family rides. Lovely bimbling on a sunnier day. We even ended up on our only totally off piste path, basically a track across a meadow. I fell off on a tussock. The only fall of the holiday, I plopped sideways about a foot. Nobody saw so it didn't happen really. Back on track and Steve put his foot down, refusing to continue to Kingarth, he was right we were running out of time if we wanted to get back to my parent's house in Penrith in sensible time tonight. We still had 30km down the coast to do, back on the mainland after a half hour ferry. So we looped back north alongside Loch Fad towards Rothesay. To be honest honour was done, we hadn't abandoned the day and that cut up north was decidedly lumpy. We were also pretty darned hungry by now and were dreaming of fish and chips. At least it was downhill and suddenly we were in suburbia. Not a pleasant quaint Scottish seaside town but a brash, trash down at heel tacky seaside town. There was a ferry at 1pm, we could see it pulling out of the harbour. So we had an hour until the 2pm. Fish and Chips! So there was a fish and chip shop with an Italian name. It didn't look very nice and a local outside told us it was pretty manky, or words to that description. Vague hand waving as to where there may be other fish and chip shops. Surely one every 50 metres? Very much a "past its glory" town since it's heyday in the 19th and first half of the 20th century, before Glaswegians could get cheap flights to proper sun in Spain! Strava was off, but we cycled up and down the prom, to no avail. Gave up and returned tho the Italian Chip shop in centre of town. not recommended. We bought a large fish and large chips and rode down to the ferry to share romantically. It wasn't that bad as we were so hungry we could have eaten almost anything, but oh my the grease. We did have an amusing exchange with a ferryman directing the cars. He wondered if we'd had a nice little ride round Bute. I told him about the rest of the tour. He looked us up and down, and grinned, and said in a very broad accent that I cannot capture on paper, "what the heck did you do so wrong to get community service like that?!" I took it as a compliment, I do not like being predictable and boring. He had us down as stark raving bonkers. Especially as he had realised the awful weather/gales the previous week that had disrupted ferries and when he found out we had done the outer Hebrides on those days he shook his head in disbelief. Glamorous breakfast/lunch in very last ferry queue, #15 Tour d'Ecosse Day 15 Secret Argyll Coast and Bute, Rothesay (Bute) to Weymess Bay. Our very last Ferry #15 back to the mainland, 2pm Rothesay - Wemyss Bay. We wish we had waited and had CalMac fish n chips on the boat! We had only cut out 10km of the tedious but necessary coast route down the A78. 30km to go. Just to test our metal there was a very stiff southerly wind and drizzle trying to blow us back north. In the best peloton mode we can muster, we took turns grinding it out back down south. Through Largs, getting lost in lots of cul de sac car parks surrounding blocks of flats, tying to stay on the bike path rather than the main road. We admired the yacht club, and Hunterson A Power station and went back on the road. The last 20km was the longest 20km ever. we made it, into Ardrossan, riding along the road we had driven exactly two weeks earlier. It was pretty emotional. We had made it. It seemed like months and minutes since we caught that first ferry. We had not suffered any injuries, our hearts and knees had made it. Round the corner, and along the last few metres to the end of the line at Ardrossan ferry terminal for Brodicck. The ferry was in, jaws wide open, loading for the trip to Arran. Yes I would have boarded and done it all over again. We detoured to the loo, bought a takeaway cup of tea in the terminal and took the cheesy end of trip selfie. Tour d'Ecosse finished at 4.20pm. The car was still in the dodgy car park alongside. Frozen we shovelled panniers into the car, took quick release wheels off with frozen hands, upended the bikes into the back and pounced on clean dry warm clothes left in the car, shamelessly changing in the car as a run to the terminal would have meant the dry clothes would get wet. We still did a 100km and 1000m today, and after 1200km and 15000m can mention we had no punctures whatsoever and the only ongoing mechanical was Steve's bearings grinding that got worse and worse. Two days later his back wheel gave up the ghost on his 2km commute to work. How lucky were we?! We drove south, caught up in the tail end of the Troon British Open traffic, back in the hurly burly world. Crossing back into England the sun was out and the temperatures were over 20 degrees. What a shock. Back to mum and dad's in Penrith, contemplating not getting on our bikes tomorrow. It was strange. I just wanted to keep on going. 1 You can do it. 2 Be ambitious, take advice, but be your own ultimate guide as to how much you can achieve. 3 Ride sensibly, accidents scupper everything. We did it. Even more amazingly I have finally finished writing it all up on the blog. 1200km and 15000m Steve finally had his heart expert exercise physiology appointment at Bristol Heart Institute in September, the one we had been hoping for before the trip. The doc just said "listen to your body, be able to talk whilst exercising" and he wished more of his patients had our approach. Turns out he was "an ageing slow triathlete" in his words, so he "got it". Steve had a Type A aortic dissection in Jan 2015, the reason this trip didn't happen last summer. The Upper Danube (flat and dry and warm) Steve's vote! LEJOG Land's End to John O'Groats. I Got the Cicerone guide out of the library and a route I had had no interest in at all is now appealing. To explore over two weeks and not sprint. Never mind New Zealand dreams! !